Take out bags from Restaurant Bags.com are always affordable and made with the environment in mind to help you improve your carry out service. Get all your FAQs about take out bags answered here. Can I include more than one size or style of take out bags per order? Yes. Before you check out in the shopping cart you have the option of selecting another size or style of take out bag. 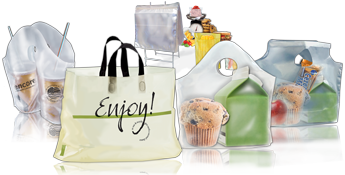 Your customized take out bag information will be saved for all subsequent bag styles you want to purchase. If I buy multiple sizes can each bag be a different color and/or print? Orders with different colors or different print graphics must be placed as separate orders for each item. You can also contact our representatives who will process the order over the phone. Can my logo be printed in more than one color on the take out bags? Yes. Please upload your logo, design your bag, save the order and contact our sales department to help finalize the exact color separations desired. I want to buy a large quantity to save money but I don't have room for all those take out bags in my restaurant. Can I order a large quantity and have them shipped as I need them? Yes. Place your order and then contact our sales department to make arrangements for smaller shipments and/or multiple locations. Can I have my take out bags split shipped to more than one location? Yes. After placing your order contact our sales department and they will make arrangements to ship your order to different locations. A nominal shipping charge may be added. How will I know my order will be produced correctly? You will receive a confirmation e-mail within 24 hours after placing the order. Order details and a proof layout for the bag(s) ordered will be included. Any corrections can be made at that time. You will receive an order confirmation by e-mail within 24 hours after placing the order. If you fail to cancel the order or make changes at that time the order will be produced and your credit card will be charged for the full amount. Will there be any color variation in the print? On your order confirmation the PMS ink color will be identified. A slight variation in color may occur during the manufacturing process. Our manufacturing Quality Control standards will ensure the color variation remains within one shade darker or lighter. Are these take out bags safe for food contact? Yes. All of our bags are manufactured in California under the strictest environmental regulations. All inks are water-based and neither our inks or colorants contain any heavy metals (no toxic levels of lead or harsh chemicals). The base polyethylene raw material is FDA approved for use in food contact. Our manufacturing facility has received a rating of "Superior" by multiple food manufacturing certifying agencies. If I am unhappy with the take out bags can I return them? Since the bags are customized they can not be returned. In the unlikely event that there is a quality problem, we will replace any unused takeout bags - 100% quality guarantee. To make a quality claim, please contact our sales representative.